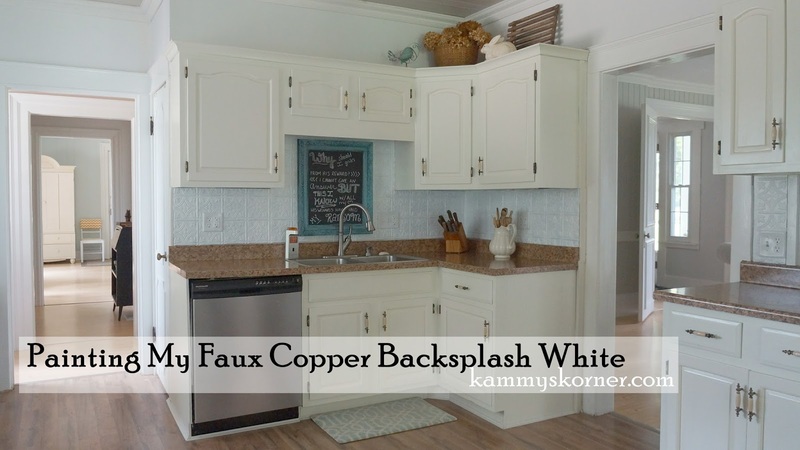 Kammy's Korner: Bad Backsplash Decision Fixed With Paint! So I headed in to Lowes and bought my countertops. I had about one day to decide what I wanted. Not a good idea to rush on stuff like that. The brown tones in them does not really match my home's style.... but for now that's what I need to live with. 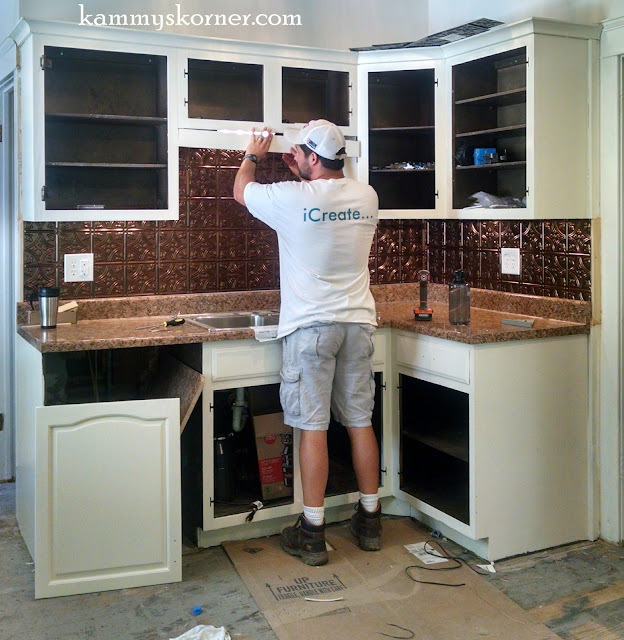 I bought the square of faux copper PVC squares in stock at Lowes for the backsplash. Can you believe this? I still hardly can as I type this. One morning as I'm feeling overwhelmed, I get a text from two sweet girls out in Wisconsin who I have the privilege of knowing and said they were on their way out to help with whatever I needed help with!!!! God bless their wonderful souls. They drove to Michigan and rolled their sleeves right up. Abigail, in the pink shirt, is a bit brainy. So with her math skills, I set her to work cutting and fitting the tiles on the wall. Heather (pictured on the right) was her trusty sidekick and they did an amazing job!! Jennah Sailor from just down the road heard her gal pals were here showed up for fun, but she rolled up her sleeves and set right to work, too! What a wonderful circle of people I know!!!! Here is their work completed! Luke Kember, another pal of mine, cut off the scallops on the board that goes over my sink. Wasn't a fan of those. Yes, put your sunglasses on, those outlet covers are seriously blinding! 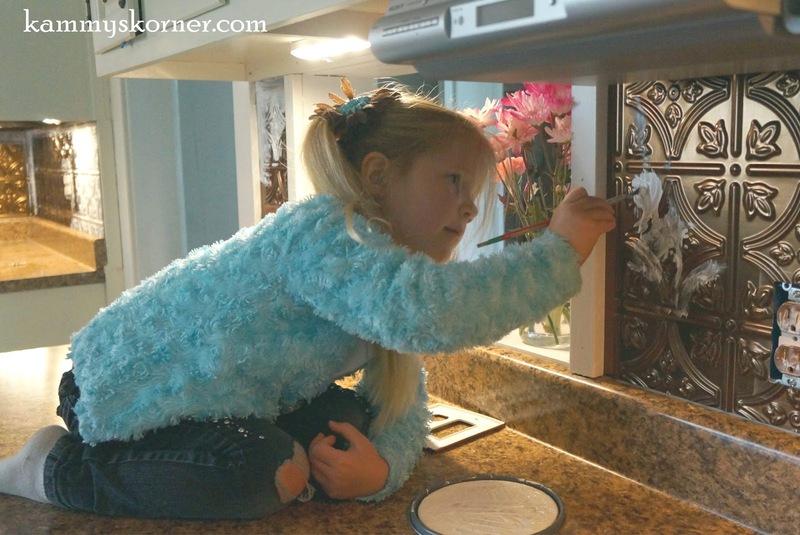 I went to all the trouble of spray painted them to blend in with the new backsplash with a hammered copper metal spray paint. It worked GREAT and I was even going to blog about it.... but alas, my "copper" didn't stay "copper"! I supposed I could still blog about it, since others might want to try it! The "copper" looks okay. But just "okay". 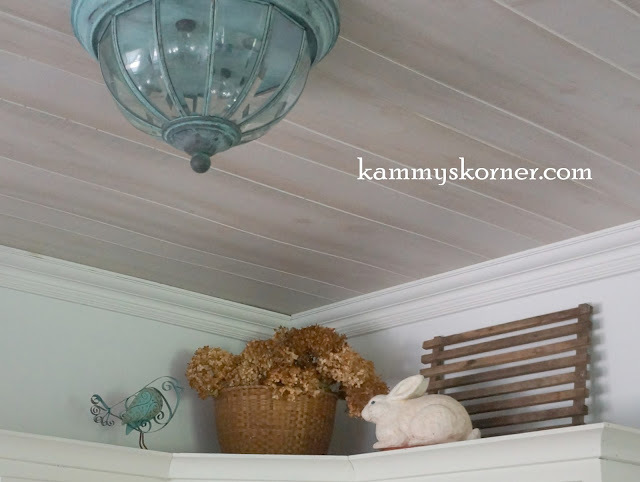 My home is full of grays and whites and airy, light colors. I'm not a "brown" girl. This screamed "LOOK AT ME! I'M BROWN! AND I STAND OUT LIKE A SORE THUMB!!!!" My mother agreed, even though she's a "brown" warm tone person, and since she had the paint on her brush from another project, said "Kammy, it's time!" 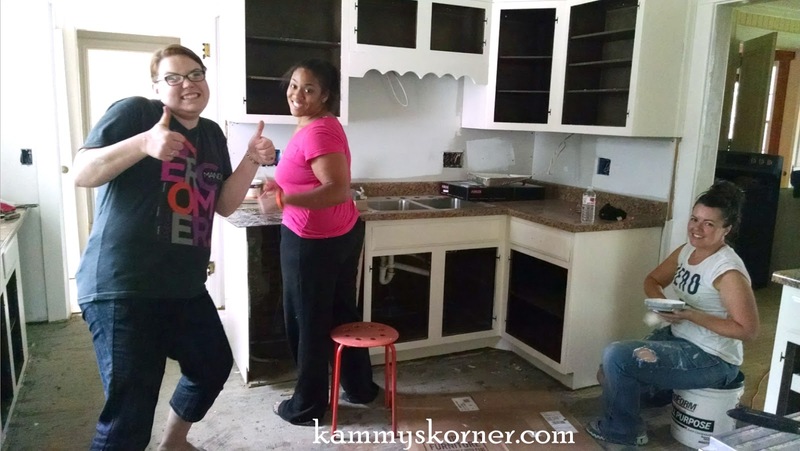 So not even up a whole year, and we're already giving the backsplash a makeover!! Oh, and do you see the difference in the hardware? Comment if you can tell what we did to make them "lighter". Mom helped me arrange a little vignette in the open space above the cabinets, too. I love how the bird ties in with the color of my light fixture (which I don't know where it originally came from, just that I took it from our old house! Someone will inevitable ask). We used a semi gloss trim paint by Dutch Boy from Menards. Would you have painted or left it? Do you make quick decisions on semi-permanent decor and regret it? I'm curious to know your thoughts! 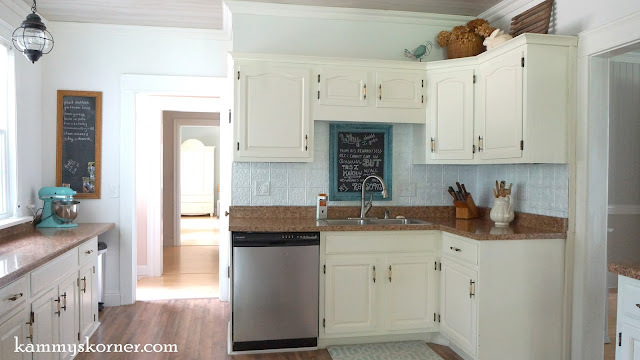 One last question, do my cabinets look too creamy now with the ultra white backsplash? Do they need a dose of white on them? And what color would you paint the walls? Can you believe I haven't painted the walls yet? I would love to hear your input!! I counter top painting in your future:) Unless they are granite, which I cannot remember if you mentioned! Oh my goodness, Kammy!! I know exactly what your talking about when it comes to quick decisions in decor going wrong!! Don't even get me started on our kitchen! UGH! Paint is the worst for me. 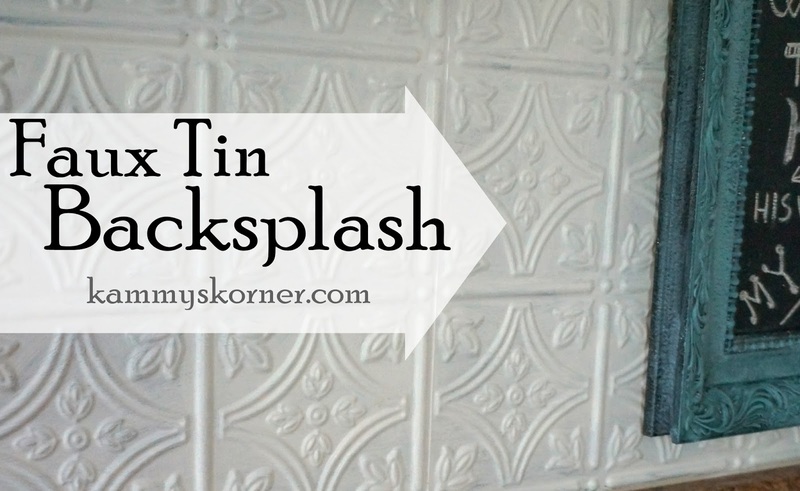 I think I LOVE a color, but once it's up on the wall-no way! Which is why I've painted our kitchen three times-and why I doubt the makeover will ever be complete!! LOL! -Anyway-I LOVE your newly painted back splash!It gives your kitchen that cottage-farmhouse look I absolutely ADORE! I also love the ceiling-and cute vignette above the cabinets! As for the knobs on your cabinets, I've looked at the photo's ten times-and STILL can't figure out what you did-but they look great! Have an awesome weekend!!! 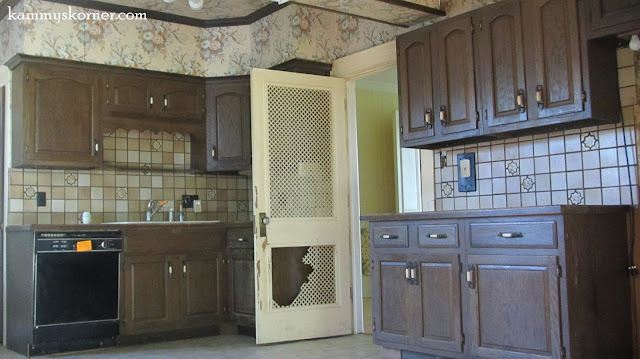 I think on the cabinet hardware you either (a) painted the back of the hardware the same color as the cabinets, or (b) sliced of the back of the hardware, removing the back, and then reattached them to the doors. Option b sounds like a lot of work to me, but you, my dear, are not afraid of a little elbow grease to get the job done! Did I come close????? You removed the back plates. Good choice! I think the white tiles look much better. I like your brown counters better with the white tiles, they pick up the richness of your floors. I like them both actually! But because copper gets such a beautiful blue/green patina, I think I would've tried to achieve that as well and then paint over if I didn't like it, then. White is always a great classic! 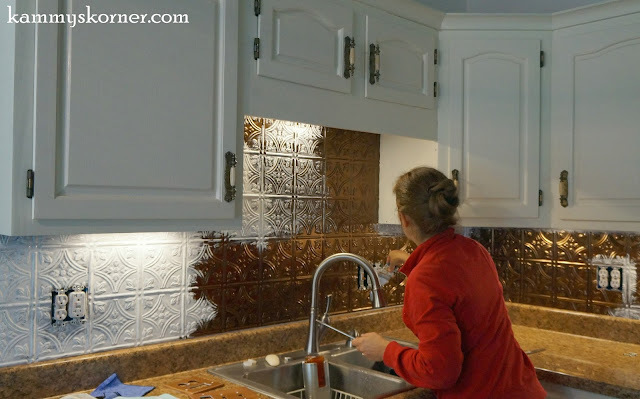 Laura, I'm pretty sure she said the 'copper' tiles are plastic...PVC, and as such, would never develop a patina. I agree. I think the copper was a little too heavy against the white cabinets. And I think the counter tops need a coat of paint. The back splash looks much better. Wow GREAT JOB! i'm impressed!! Your kitchen is wonderful! I really like the backsplash painted. I loved your copper backsplash! 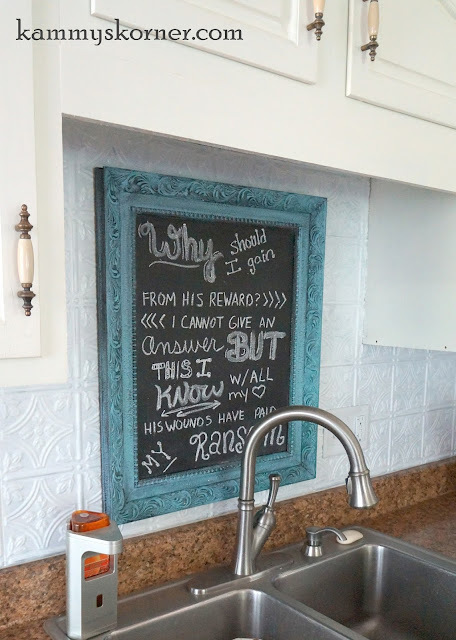 I was seriously considering it in my kitchen reno. You might have painted it a silver tone, like brushed nickel to lighten it up as an alternative to the white, but the white does seem to "go" better than the dark. Love what you have done with the kitchen! It looks so much bigger after the remodel. Out of curiosity, have you ever done or thought about cement countertops? I thought they would be hideous, but after seeing a few of them, I like the look. Just wondered what your diy thoughts might be. We weren't going to pour them, just cover over old ones. Since you asked ... I would have left the copper tiles unpainted for as long as they didn't discolor and simply have gotten one of those spray painting kits from the store where you can make your counters look like granite. They have different colors and a white-ish one would have made the copper a stunning color pop.